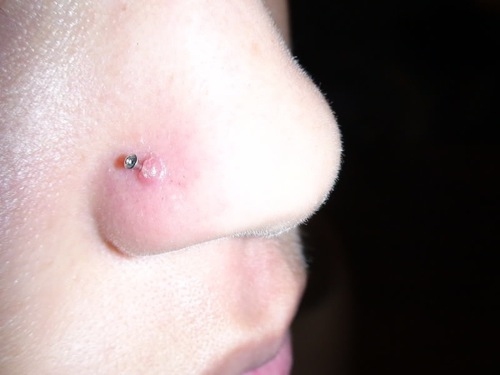 Bump on Nose Piercing— Is It an Infection? A bump on nose piercing can form a few days or months after the piercing is done. Normally, the bumps form as a result of trauma to the pierced area. Trauma occurs when the ring or stud is knocked, tugged or has been removed and reinserted, causing damage to the surrounding tissues. The bumps normally appear red and raised. Left untreated, a nose piercing infection can lead to the development of scar tissue. For this reason, you should take remedial measures as soon as possible. Not every bump on your nose piercing is a sign of infection. There is a chance that it's only a granuloma. A Granuloma is simply a benign body tissue growth that is harmless. It usually has a red and raw formation and bleeds easily and at times drains a clear or yellow fluid. Africans and Asians are the most likely to suffer from keloids (a type of raised scar) than other races. If you have an infected bump, it will resemble a pimple and might even have pus. If it does have pus, then you should seek treatment before it forms a pustule or abscess. A pustule is a hard lump formation that occurs under the skin as a result of the body’s attempt to isolate and encapsulate chronic infections. While it is not easy to identify an infected nose piercing , you should check whether the bump is pink, tender and looks like a pimple. Applying some tea tree oil to a nose piercing infection is a great way to deal with it. 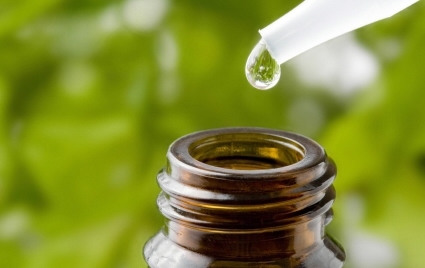 Simply take some tea tree oil and add a drop to some jojoba oil or any other carrier oil. Apply the mixture to the infected area using cotton wool. Do this only two times as tea tree oil can cause your skin to dry out. Using a hot compress is the easiest way of getting rid of a bump on nose piercing. Simply soak some cotton wool in a hot solution of sea salt and press it onto the bump until the heat dissipates. Do this thrice a day for about 5 days. You should ensure that the compress is hot enough for the heat to penetrate the bump. Once you’re done, rinse the area to get rid of any salt residue. Chamomile tea can also help remedy an infected nose piercing. 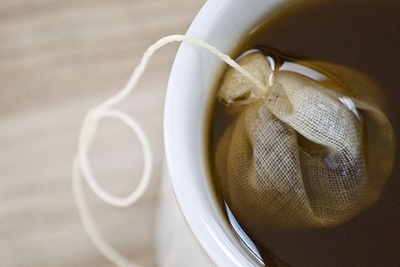 Simply add some chamomile tea bags to a container with hot water. Take out one of the bags and compress it on the bump until it cools off. Dip it again and repeat the procedure thrice a day for about ten minutes each time. 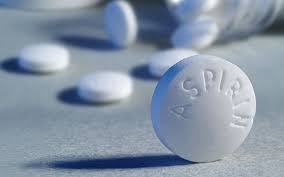 Aspirin is an anti-inflammatory drug which means that it can heal your infection without causing an irritation. Make an Aspirin paste with a few pills and pure water. Apply the paste on the bump every night before going to bed. It can be easily absorbed into the skin and allow the infection to drain. Medication such as ibuprofen can help if the bump is due to trauma. This can happen if you accidentally knock the nose piercing or pull out the ring accidentally. At times, the infection causing the bumps is caused by your choice of jewelry. Only wear surgical stainless steel, quality niobium and titanium jewelry. Avoid going for the cheap or free jewelry offered at piercing shops as they can easily cause infection. Warning: avoid changing jewelry until the piercing has healed completely. Should an infection develop after the piercing, do not try to remedy the situation at home. Go back to the piercing professional who did the piercing and have them change the jewelry for you. Refrain from trying to drain the infected bump. This could make it much worse than it already is. This is especially so if you use a contaminated tool that will introduce bacteria into the wound. If the infection enters the bloodstream, it can turn fatal. You should see a doctor and let them determine whether or not the bump should be drained.